I am writing today to update you on our process to create a new 5-year plan for Philadelphia’s homeless assistance system. We started in July 2017 and released the new plan in September 2018. Philly’s homeless assistance system is comprised of an impressive network of homeless services, legal, housing, physical and behavioral health providers, and governmental entities, all working toward the same goal of making homelessness rare, brief, and nonrecurring. The Office of Homeless Services (OHS) provides support, leadership, funding, coordination and administration to this network, which is called the Continuum of Care. 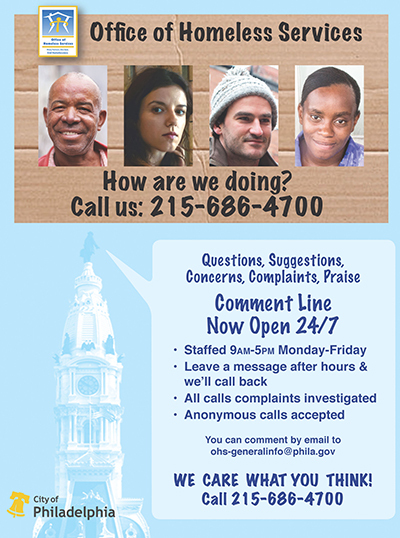 On this site you’ll find useful information on Philly’s homeless housing system including information about why people are homeless, how many and what our strategy is. We also provide information on where to go for help including a list of service providers, how to help homeless individuals, current events and stories of progress on the News page. Housing retention, emergency assistance and response, homeless prevention and rapid re-housing are all important pieces of preventing homelessness. These programs provide support, outreach, and assistance to many who are at risk of becoming homeless. There are multiple programs in place for short-term housing and crisis support. These range from shelters to food distribution programs, as well as transitional housing and relocation services.